Naive peripheral B cells are maintained in sufficient numbers and diversity to mount effective immune responses against infectious agents. However, the size and repertoire of this B cell pool is constantly diminished by normal cell turnover and Ag activation. Homeostatic (Ag-independent) proliferation in response to B cell depletion is one mechanism to compensate for this cell loss. We have used purified CFSE-labeled B cells and an adoptive transfer model system to show that immature and mature B cells divide in a variety of B cell-deficient (scid, xid, IL-7−/−, and sublethally irradiated) hosts. Homeostatic B cell proliferation is T cell independent, and B cells that have replicated by this mechanism retain the antigenic phenotype of naive B cells. Replication is significantly reduced in B cell-sufficient normal or B cell-reconstituted immunodeficient recipients by the action of competing mature follicular B cells. Using xid mice and transcription factor knockouts, we show that the activation signal(s) that lead to homeostatic B cell proliferation require Bruton’s tyrosine kinase; however, c-Rel, a Bruton’s tyrosine kinase-induced NF-κB/Rel transcription factor critical for Ag and mitogen stimulation, is dispensable, indicating the uniqueness of this activation pathway. Survival and replication signals can also be separated, because the transcription factor p50 (NF-κB1), which is required for the survival of peripheral B cells, is not necessary for homeostatic replication. Homeostatic B cell proliferation provides an Ag-independent mechanism for the maintenance and expansion of naive B cells selected into the mature B cell pool. The size of the naive peripheral lymphocyte pool is the result of constant and dynamic modulation reflecting the interplay between lymphogenesis in primary lymphoid organs, selection of newly emergent cells into the long-lived pool, survival in the periphery, and depletion following antigenic encounter (1, 2). Despite these conflicting forces, naive lymphocyte populations are maintained at remarkably constant numbers by poorly understood homeostatic mechanisms. Central to the concept of homeostatic regulation in the periphery are lymphocyte-intrinsic sensing and response mechanisms that detect reduction in the size of the total lymphocyte pool, allow compensatory lymphocyte expansion, and maintain tight regulation of expansion through feedback inhibition. The sensing and response reactions likely occur in a unique local microenvironment and are specific for lymphocyte subpopulations, because B and T cell numbers are independently regulated (3). Understanding the mechanisms maintaining naive peripheral B cell homeostasis will contribute new insights into disease processes where lymphocyte numbers are dysregulated (autoimmunity or immunodeficiency) or where lymphocyte reconstitution is essential, e.g., following chemotherapy. Lymphocyte survival, which is currently considered the dominant mechanism for maintaining peripheral homeostasis, is an active process requiring signals delivered through cell surface receptors that control the expression of antiapoptotic molecules (4, 5, 6). In B cells, these signals are delivered through the B cell Ag receptor (BCR)4 (7, 8, 9) and the receptor for B cell-activating factor (BAFF) (10, 11). Similarly, survival of naive T cells depends on signals through the TCR as well as the IL-7R (4, 12, 13). It has been proposed that competition between lymphocytes for ligands that promote survival is a major regulatory control on lymphocyte numbers (3, 14, 15). The size of the lymphocyte pool is also regulated by homeostatic proliferation, which refers to lymphocyte replication occurring in lymphopenic hosts in the absence of overt antigenic stimulation (16). For example, it has been shown that the adoptive transfer of CD4 or CD8 T cells into T cell-deficient hosts results in expansion of the donor T cells (17). Homeostatic proliferation is also observed at low levels in normal hosts and may act to compensate for cells removed from the naive lymphocyte repertoire during immune responses. Consistent with this idea, proliferation of non-Ag-specific “bystander” T cells is seen during viral infections (18, 19). Homeostatic T cell proliferation, like survival, requires peptide-MHC complexes in the host environment as well as IL-7 (12, 13). The similarity in signaling pathways used for homeostatic proliferation and survival is the basis for the paradigm that, when T cell numbers are reduced, the availability of critical cytokines and/or access to ligand(s) that promote survival is increased and proliferation is induced (17, 20). However, a recent report (21) showing that homeostatic proliferation, but not survival, of T cells requires p56lck indicates that the relationship between these two processes is likely to be more complex than first envisioned. Little is known about the mechanisms that maintain the naive peripheral B cell pool. Whereas lymphopoiesis, selection, survival, and antigenic encounter are key elements that contribute to pool size, it remains to be determined whether other mechanisms are also active. By using an adoptive transfer model and CFSE-labeled donor B cells, we show that both immature and mature B cells have an intrinsic sensing mechanism that causes them to proliferate in response to B cell deficiency. Homeostatic replication of both populations is inhibited by mature follicular B cells. B cells that have undergone homeostatic proliferation differ from those proliferating in response to Ag or mitogen in that they essentially retain a naive phenotype and do not differentiate to effector function. Like other signals mitogenic for B cells, induction of homeostatic proliferation requires Bruton’s tyrosine kinase (Btk), a cytoplasmic kinase necessary for B cell proliferation, survival, and maturation (22). One consequence of Btk activation is the translocation to the nucleus of c-Rel, a member of the NF-κB/Rel family of transcription factors (23, 24). Despite this, it is not required for homeostatic proliferation, although it is critical for BCR- and mitogen-induced proliferation (25, 26), indicating that the requirements for Ag- and homeostatic-induced proliferation are distinct. Finally, NF-κB1 (p50), which is critical for optimal B cell survival in vivo (26), is also dispensable for homeostatic proliferation, demonstrating that survival signals are distinct from those mediating homeostatic replication. CBA/N × A.By, C57BL/6, CBA/Ca-bcl-2 transgenic, or CBA/N-bcl-2 transgenic (27) mice (aged 8–24 wk) were used for donor cells. CBA/N × A.By female (normal) or male (xid), CBA/Ca (normal), CBA/N (xid), C57BL/6, or C57BL/6.scid mice (aged 12–16 wk) were used as recipients. IL-7-deficient mice (28) were obtained from Dr. R. Murray (DNAX, Palo Alto, CA), and B6 × 129 F3 hybrids were generously provided by Dr. R. Gerstein (University of Massachusetts Medical School). B6.CB17-Prkdcscid/szJ (B6.scid) mice were a kind gift of Drs. D. Greiner and E. Szomolanyi-Tsuda (University of Massachusetts Medical School). Mice were bred and maintained at the University of Massachusetts Medical School, using stock mice obtained from the National Cancer Institute (Frederick, MD) or The Jackson Laboratory (Bar Harbor, ME). c-rel−/− mice (29), obtained from Dr. H.-C. Liou (Cornell University Medical School, New York, NY), were maintained at Brandeis University by Dr. R. Sen, as were B6.xid mice, generously provided by Dr. J. Press. In some experiments, recipients were irradiated using a 137Cs source (Gammacell, Toronto, Canada) 24–48 h before adoptive transfer. All animal care and procedures were conducted in accordance with the Animal Welfare Act. Total spleen or lymph node (excluding mesenteric) cell suspensions were prepared by gently pressing lymphoid organs between glass slides in HBSS-BSA (0.3% w/v) supplemented with 100 μg/ml streptomycin, 10 μg/ml penicillin, and 10 μg/ml gentamicin. B cell-enriched spleen cell populations were prepared by treating pooled spleen cell suspensions with anti-Thy 1.2 mAb (clone J1J10) and mouse-adsorbed rabbit complement as previously described (15). Small resting cells (B cells, total spleen cells, or lymph node cells) were prepared by fractionation on a Percoll step gradient (50, 65, and 75%) prepared in HBSS, and cells were harvested at the 65:75% interface. Purified B cells analyzed by flow cytometry were 85–95% B220+. Spleen cell populations enriched for immature B cells were produced in autoreconstituting, sublethally irradiated donors as described by Allman and Cancro (30). Briefly, spleen cells were taken from CBA/Ca or CBA/N × A.By normal donors irradiated 12–13 days previously with 550 rad of whole body irradiation. B cells were prepared by anti-Thy1.2 and complement treatment, followed by depletion of dead cells and erythrocytes on 50:70% Percoll gradients and harvesting cells at the 50:70% interface. Immature B cells prepared by this procedure were >90% B220+ and uniformly CD24 (heat–stable Ag (HSA)high), p130–140 (493, AA4.1)+, IgMhigh, and IgDlow. Small resting lymphocytes or immature B cells were stained with the vital dye CFSE (Molecular Probes, Eugene, OR) as previously described (31). Briefly, cells were washed and resuspended in serum-free PBS or HBSS at 50 × 106 cells/ml and mixed with an equal volume of 2 μM CFSE in PBS (1 μm CFSE final concentration). The cells were incubated at 37°C for 10 min with gentle shaking and washed twice with HBSS-BSA. Cells were resuspended in PBS or HBSS and injected i.v. via the lateral tail vein. Single-cell suspensions made from the spleens of individual adoptive transfer recipients were treated with hemolytic Gey’s solution (32) to remove RBC and resuspended in ice-cold FACS buffer (PBS, 3% FCS, and 0.02% sodium azide). Cells were treated with anti-FcR Ab (2.4G2) and analyzed for surface Ag expression using the following: APC-, PE-, or Tricolor-conjugated anti-B220 (RA3-6B2), PE-conjugated anti-I-Ak (14V.18), anti-B7-1 (RMMP-2), anti-B7-2 (RMMP-1), anti-CD25 (PC61.5.3), anti-CD71 (RI7217.1.4), PE- or APC-conjugated anti-Thy1.2 (CT-TH1) (Caltag Laboratories, Burlingame, CA); PE-conjugated anti-IgD (11, 12, 13, 14, 15, 16, 17, 18, 19, 20, 21, 22, 23, 24, 25, 26) or anti-CD69 (H1.2F3) (Southern Biotechnology Associates, Birmingham, AL); PE-conjugated anti-HSA (M1/69) (BD PharMingen, San Diego, CA). Biotinylated goat anti-mouse IgM (Fisher Scientific, Pittsburgh, PA), anti-CD38 (clone 92), or anti-CD62L (MEL-14) (BD PharMingen) were detected with streptavidin conjugated with Tricolor, PE (Caltag), or CyChrome (BD PharMingen). The p130–140 Ag was detected using a mixture of 493 Ab (33) produced from a hybridoma generously provided by Drs. A. G. Rolink and F. Melchers (Basel Institute for Immunology, Basel, Switzerland) and AA4.1 Ab (34) generously provided by Dr. R. Gerstein. Biotinylated Abs to 493 or AA4.1 were detected with streptavidin-Tricolor or streptavidin-CyChrome. After staining, cells were washed with FACS buffer and fixed with 2% paraformaldehyde in PBS before analysis on either a FACSCalibur or FACSVantage machine. In all experiments, 100,000–150,000 events were collected. Dead cells were excluded based on forward and side scatter, and data was analyzed using FlowJo (Tree Star, San Carlos, CA). Adoptively transferred cells were labeled with BrdU in vivo by administering 1 mg of BrdU in PBS i.p. immediately after adoptive transfer, and then feeding the recipients BrdU continuously in their drinking water (1 mg/ml) for 1 or 2 wk. BrdU containing drinking water was shielded from light and changed every 3 days. Single-cell suspensions of splenocytes from individual recipients were stained for incorporated BrdU using the procedure of Lentz et al. (35), modified by using unlabeled anti-BrdU (BD Biosciences, Mountain View, CA) as the primary Ab and PE-conjugated rat anti-mouse IgG1 (BD Biosciences) as the detecting Ab. xid mice carry a mutation in Btk, which impairs full B cell development and results in a marked reduction of mature peripheral B cells (36, 37). This B cell deficiency allows us to assess the ability of transferred normal B cells to sense and respond to a selective deficit in the mature B cell compartment without the use of ionizing radiation, which can induce pro-proliferative factors (38, 39). Small resting normal splenic B cells were stained with CFSE (31) to allow tracking and determination of cell divisions, and transferred into nonirradiated normal or xid recipients. CFSE+ B cells were readily detected in the spleens of xid recipients early after transfer (day 2), but little cell division had occurred (Fig. 1⇓A). However, by day 14, a significant proportion (30%) of the CFSE+B220+ B cells in xid recipients had divided, with three divisions being readily distinguished (Fig. 1⇓A). It should be noted that this analysis likely underestimated the extent of cell division, because cells that divided more than three times would appear to be CFSE− and excluded from the analysis. Proliferation of the transferred B cells was dependent on B cell deficiency, because a significantly smaller proportion (6.1%, p < 0.001) of the CFSE+ B cells divided in normal recipients by day 14 (Fig. 1⇓, A and C). Analysis of replication at earlier time points showed that proliferation was ongoing over the 14-day assay period (Fig. 2⇓ and data not shown). Normal splenic B cells proliferate in B cell-deficient, but not B cell-sufficient, recipients. A, Replication of transferred B cells in xid but not normal hosts. CFSE-labeled small resting splenic B cells (40 × 106) from normal donors (CBA/Ca or CBA/N × A.By females) were transferred into xid recipients (CBA/N or CBA/N × A.By male). Spleen cells from individual recipients on day 2 or day 14 were analyzed by flow cytometry. The gate drawn in each histogram shows the percentage of B220+CFSE+ cells that have divided. B, CFSElow cells have replicated in vivo. CFSE-labeled small resting splenic B cells (20 × 106) from normal (CBA/N × A.By female) donors were transferred into xid (CBA/N × A.By male) recipients. Recipients were fed BrdU continuously in their drinking water for 14 days before sacrifice. Spleen cells were analyzed for BrdU incorporation on day 14 as described in Materials and Methods. Results are representative of two independent experiments. C, B cell replication in various lymphopenic hosts. 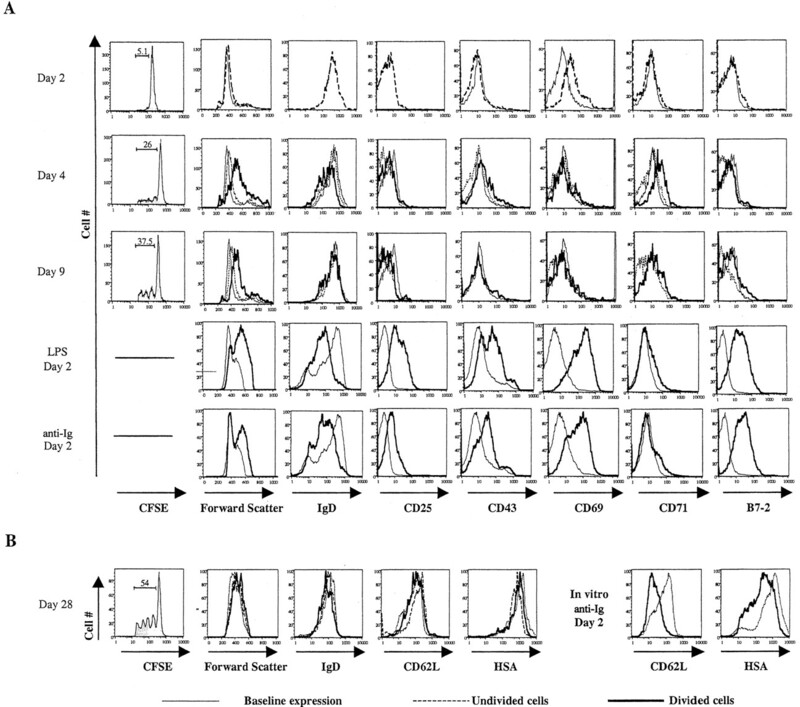 CFSE-labeled small resting splenic B cells (20–40 × 106) from normal donors (CBA/N × A.By female or C57BL/6) were transferred into syngeneic recipients; nonirradiated normal (CBA/N × A.By female or C57BL/6, n = 9); sublethally irradiated (250 rad) normal (CBA/N × A.By female or C57BL/6, n = 21); nonirradiated xid (CBA/N × A.By male, n = 15); or nonirradiated C57BL/6.scid (n = 6). The percentage of B220+CFSE+ spleen cells that have divided by day 10–14 ± SE is shown. Results are from two to seven independent experiments. Normal splenic B cells maintain a resting surface Ag phenotype after adoptive transfer into xid recipients. CFSE-labeled small resting splenic B cells (20 × 106) from normal donors were transferred into nonirradiated xid recipients. Recipients were sacrificed 2, 4, 9, or 28 days after adoptive transfer, and donor cells were analyzed by FACS as described in Materials and Methods. Results are representative of three to four mice for each time point from two to three independent experiments. Histograms show CFSE fluorescence intensity or expression of the indicated cell surface markers on CFSE+B220+ donor cells. A, Surface Ag expression and forward scatter of CFSE+B220+ donor cells day 1 after transfer were used as a baseline for comparing marker expression at days 2, 4, and 9 after transfer. Profiles of small resting splenic B cells stimulated in vitro with F(ab′)2 of affinity-purified rabbit anti-mouse F(ab′)2 (10 μg/ml) or LPS (50 μg/ml) for 2 days are shown for comparison. B, Size and surface marker expression on input resting B cells and on CFSE+B220+ donor cells isolated 28 days after transfer are shown. Stimulation of resting cells in vitro was for 2 days with anti-Ig (10 μg/ml). In some experiments, the fluorescence intensity of cells in the main CFSE+ peak (presumably undivided cells) decreased between day 2 and day 14 (Fig. 1⇑A). This could indicate that all the cells in this peak had divided or result from dye loss by the normal turnover of CFSE-labeled intracellular proteins (40). To distinguish between these possibilities, and to demonstrate that CFSE dilution correlated with cell replication, BrdU was administered continuously for 14 days to xid recipients of CFSE-labeled normal B cells. Thereafter, permeabilized splenocytes were stained for BrdU and FACS analyzed. Cells in the brightest CFSE+ fraction were in Go/G1, as only 5% of the cells incorporated BrdU (Fig. 1⇑B). In contrast, 98% of the cells in peaks with lower CFSE intensity had incorporated BrdU, clearly showing they had divided. Homeostatic proliferation also occurred in normal B cells transferred to other B cell-deficient hosts including normal irradiated (20.1 ± 1.0%) or B6.scid (33.4 ± 2.0%) recipients, indicating that B cell replication in xid (23.4 ± 0.8%) recipients was not a secondary consequence of the xid mutation (Fig. 1⇑C). Homeostatic B cell proliferation was apparently T cell independent because replication was most extensive in SCID mice, which are severely deficient in mature T cells. Further confirmation was provided by the finding that B cells from CD4−/− donors replicated as well in irradiated CD4−/− recipients as they did in irradiated normal recipients (data not shown). We conclude from these experiments that splenic B cells undergo T cell-independent homeostatic proliferation when transferred into a B cell-deficient environment. Ag or mitogen stimulation changes the cell surface Ag phenotype of both B and T cells. In T cells, homeostatic proliferation can be distinguished from Ag-induced replication by the up-regulation of memory or other activation markers (41, 42, 43, 44, 45, 46). To determine whether B cells undergoing homeostatic proliferation would be distinguishable from mitogen-activated B cells, we examined a collection of cell surface markers that change their expression pattern on Ag-/mitogen-activated B cells: IgD, CD38, or CD62L, which decrease on mitogen-activated cells (47, 48, 49); IgM, which is lost on B cells undergoing class switching (50); CD25 (IL-2R α-chain), CD43, syndecan, CD69, CD71 (transferrin receptor), MHC class II, B7-1, and B7-2, all of which are up-regulated (51, 52). Of the latter, CD69 is routinely used as an early lymphocyte activation marker, whereas CD43 and syndecan are late activation markers expressed on Ab-secreting, but not naive, B cells (53, 54). Surface marker expression on the replicating and nonreplicating fractions of small resting normal B cells transferred into xid recipients was examined before proliferation had occurred (day 2), at the beginning of proliferation (day 4), and at later times (days 9 and 28) after transfer (Fig. 2⇑). B cells analyzed less than 24 h after transfer served as the unstimulated baseline whereas B cells stimulated in vitro with anti-Ig alone or with LPS were used as staining controls. For activated cultured B cells, all of the markers selected for analysis underwent the expected increases or decreases (IgD and CD62L) in expression by 2 days in culture; this was also true for B cells stimulated with a mixture of anti-Ig and IL-4 (data not shown). For transferred B cells, although division was negligible on day 2, there was a pronounced increase in CD69 expression on most of the cells indicating the delivery of an inductive signal. Neither cell size nor other cell surface markers was affected at this early time point. By day 4, B cells which had divided demonstrated increased forward scatter, a slight decrease in IgD, and higher levels of CD71, whereas CD69 had returned to a baseline level and other markers were unaffected. In the nondividing fraction, CD69 had also returned to a baseline level, and there was no noteworthy change in any of the other markers analyzed. By day 9, divided cells were slightly larger by forward scatter, and all other markers had returned to baseline levels. Other activation markers examined—MHC class II, B7-1, IgM, and CD38, as well as syndecan, a marker for differentiation to effector function—were unchanged over this time frame on both divided and undivided cells (Fig. 2⇑A, and data not shown). The resting surface Ag phenotype appeared stable on B cells analyzed 28 days after transfer. For these cells, IgD, size, and CD62L levels were essentially equivalent for replicated and nonreplicated donor B cells and the input population (Fig. 2⇑B). The slight decrease in HSA levels relative to input cells was seen on all donor B cells but was not considered significant relative to the changes on B cells activated in vitro (Fig. 2⇑B). These data suggest that homeostatic B cell proliferation is distinct from Ag- or mitogen-driven proliferation in that the cells undergoing replication essentially maintain a resting phenotype. B cells undergoing homeostatic proliferation in these transfers are derived from a heterogeneous assortment of immature and mature splenic B cells. To directly demonstrate that mature follicular B cells underwent homeostatic proliferation, we used lymph nodes as a source of donor cells, because immature, marginal zone, and B-1 B cells are extremely rare in this organ (55, 56). A typical experiment is shown in Fig. 3⇓A; donor B cells (B220+) from spleens or lymph nodes of normal mice divided after adoptive transfer into xid recipients, 24 and 18%, respectively, while donor T cells (Thy1.2+) from spleens or lymph nodes did not, 7 and 5%, respectively. Data from several experiments show that cell division in lymph node B cells was comparable to that of purified splenic B cells (Fig. 3⇓B; 19.3 ± 0.5% vs 21.4 ± 0.6%). Moreover, we have found that divided splenic B cells lack the p130–140 Ag found on transitional B cells (data not shown). The fact that T cells in the same inoculum did not divide extensively in T cell-sufficient xid recipients confirmed that the expansion was lymphocyte subpopulation specific. We conclude from these data that mature B cells are capable of homeostatic proliferation in B cell-deficient recipients. Mature and immature B cells proliferate after adoptive transfer into xid recipients. A, Mature B cells, but not T cells, proliferate in xid recipients. CFSE-labeled small total spleen or lymph node cells (20–40 × 106) from normal donors (CBA/N × A.By female) were transferred into xid recipients (CBA/N × A.By male) and recipient spleen cells analyzed on day 14. Representative histograms demonstrating the extent of cell division in CFSE+ donor B cells (B220+) and T cells (Thy1.2+) are shown. B, Comparison of the extent of cell division in the indicated donor cell populations after adoptive transfer into xid recipients is shown. Results were compiled from 10 recipients in each group from three independent experiments and are shown as the percent divided ± SE. C, Replication of immature B cells in xid, but not normal, hosts. Pure populations of transitional B cells were prepared from normal donors (CBA/N × A.By female) as described in Materials and Methods. Cells (25 × 106) were adoptively transferred into either nonirradiated normal (CBA/N × A.By female) or xid (CBA/N × A.By male) recipients and analyzed on day 10 after transfer. To assess the capacity of immature B cells to undergo homeostatic proliferation, we isolated a highly enriched population of these cells from the spleens of mice undergoing autoreconstitution after sublethal whole body irradiation (30). Two weeks postirradiation, the splenic lymphocytes consist almost exclusively of newly emergent immature B cells (>90% pB130–140+ and HSAhigh)(Refs. 30 and 33 and M. Schmidt, unpublished observations). CFSE-labeled immature B cells transferred into xid recipients replicated almost as extensively as mature B cells (36.2 ± 2.9%, Fig. 3⇑C vs 21.4 ± 0.6%, Fig. 3⇑B). As was found for mature B cells (Fig. 1⇑), immature B cells replicated poorly when transferred to normal nonirradiated recipients (5.7 ± 2.2%, Fig. 3⇑C). Taken together, these data demonstrate that both mature and immature B cells are capable of homeostatic proliferation in hosts deficient in mature B cells. Homeostatic proliferation of T cells is not seen under “lymphocyte-sufficient” conditions, e.g., when normal mice are used as recipients or when high doses of T cells are adoptively transferred (45). To determine whether B cells were sensitive to a similar feedback inhibition, we transferred increasing numbers of CFSE-labeled purified B cells to xid recipients (Fig. 4⇓A). There was an inverse correlation between the number of B cells transferred and the degree of homeostatic replication, with the least proliferation observed with the highest dose of B cells. These differences were highly significant (p = 0.03 to <0.001) and suggest that proliferation may be limited by competition with other B cells. Indeed, inhibition of B cell proliferation was also observed when increasing numbers of unlabeled normal splenic B cells were mixed with a constant dose of normal CFSE-labeled B cells (Fig. 4⇓B). In contrast, competing xid B cells, when used in a similar mixture and transfer procedure, had no inhibitory effect (Fig. 4⇓B). Mature, but not immature, B cells mediate feedback inhibition of homeostatic proliferation. A, Inhibition of mature B cell homeostatic proliferation at high cell doses. The indicated numbers of CFSE-labeled small resting splenic B cells (mature B cells) from normal donors were transferred into xid recipients, and recipient spleen cells were analyzed on day 12. The percentage of B220+CFSE+ cells that had divided ± SE is shown. Gates were set to only look at one cell division to avoid the inclusion of background CFSE− host cells at the lower cell doses. Results of two independent experiments were averaged (n = 9–10 mice/cell dose). B, Replication of adoptively transferred normal B cells is inhibited by competition with normal but not xid B cells. CFSE-labeled small resting splenic B cells (15 × 106) from normal donors were mixed with the indicated numbers of unlabeled normal or xid splenic B cells, and the cell mixtures were transferred into nonirradiated xid recipients. Replication of CFSE-labeled donor B cells was determined 13 days after transfer. Competing B cells used were the following: normal B cells (□), xid B cells (⬗), and control (without competitors) (▴). The values of p (Student’s t test) compared with proliferation of control B cells were as follows: ‡, p > 0.3; ∗, p < 0.04; and ∗∗, p < 0.01. C, Homeostatic proliferation of immature B cells is not inhibited at high doses of transferred B cells. The indicated numbers of purified CFSE-labeled immature B cells were transferred into nonirradiated xid recipients and analyzed on day 10. Immature B cells, which replicate actively when transferred to xid recipients, replicate poorly when transferred to normal recipients (Fig. 3⇑C), suggesting that they are subject to inhibition. The fact that immature B cells replicate actively in xid recipients, despite the fact that xid mice have an increased population of immature splenic B cells, also suggests that immature B cells cannot mediate feedback inhibition. To test this possibility, graded doses of immature B cells were transferred into xid recipients. In striking contrast to the behavior of mature B cells, homeostatic proliferation of immature B cells was equivalent at all cell doses transferred (10, 30, and 90 million cells, Fig. 4⇑C) showing no evidence of feedback regulation. This effect was not due to homing differences between mature and immature B cells, because the number of CSFE-labeled cells increased proportionately and directly as the dose of transferred cells was increased (data not shown). The data, in toto, indicate that mature B cells play a central role in peripheral homeostasis by regulating their own homeostatic proliferation and that of immature B cells, their immediate precursors. To better characterize the cytokine requirements and the B cell-mediating feedback inhibition, we used IL-7-deficient recipients. These mice demonstrate a selective immunodeficiency in which follicular B cells and T cells are markedly reduced (28), whereas marginal zone B cells and B1 cells form a stable peripheral pool of B lymphocytes comparable to that found in wild-type mice (57). To assess whether marginal zone and B1 B cells inhibit homeostatic B cell proliferation, we transferred CSFE-labeled populations of Percoll-purified small total spleen cells into nonirradiated IL-7−/− mice or sublethally irradiated (400 rad) B6 mice. This experimental procedure also allowed us to determine whether homeostatic B cell proliferation is IL-7 dependent, as has been shown for T cells. The results of these experiments (Table I⇓) show a number of points. Replication of both B and T cells is robust in recipient B6 mice rendered lymphopenic by sublethal irradiation. B cells still replicated actively upon transfer to nonirradiated IL-7−/− recipients, showing that homeostatic B cell proliferation is IL-7 independent. However, proliferation of T cells was uniformly and significantly reduced in IL-7−/− recipients relative to that of irradiated B6 (p < 0.001), confirming previous reports of a requirement for IL-7 to drive homeostatic T cell proliferation (12, 13). To determine whether marginal zone or B1 B cells had an inhibitory effect on homeostatic B cell replication, we also transferred CSFE-labeled spleen cells into IL-7−/− recipients depleted of lymphocytes by sublethal irradiation (58) (Expt. 3, Table I⇓). We find that B cell replication was essentially equivalent in irradiated and nonirradiated IL-7−/− recipients, whereas homeostatic T cell proliferation was inhibited in both sets of recipients. We conclude from these experiments that homeostatic B cell replication is independent of IL-7 and that marginal zone and B1 cells are incapable of exerting significant feedback inhibition on proliferation. The signals that drive homeostatic expansion of B cells are unknown. For T cells, TCR signals are important for survival and homeostatic proliferation (8, 9, 41, 42, 59, 60, 61, 62). The critical role of the BCR in B cell survival suggested that it might play a similar role in homeostatic B cell proliferation. xid mice have a defect in Btk, a Tec family tyrosine kinase involved in numerous signaling pathways in B cells (22). As a result, xid B cells proliferate poorly in response to stimulation through the BCR and other receptors (63, 64, 65, 66, 67). This led us to hypothesize that the signaling defects in xid B cells might render them less responsive to the in vivo signals that drive homeostatic expansion. We examined this possibility by comparing the ability of normal (B6) or B6.xid congenic B cells to replicate in B6.scid recipients. We found that B6.xid B cells underwent significantly less homeostatic proliferation than normal B cells (Fig. 5⇓A; B6.xid, 5.5 ± 0.2% vs B6, 33.4 ± 1.4%, p < 0.001). Because the severity of the Btk mutation is known to be affected by genetic background (68), we also tested the ability of B cells from CBA/N (xid) mice to proliferate in syngeneic xid recipients. As with cells from B6.xid donors, xid B cells from CBA/N donors underwent significantly less homeostatic proliferation than did normal B cells (Fig. 5⇓B; 12.2 ± 1.1% vs 24.3 ± 1.1%, p < 0.001). To exclude poor survival of xid B cells (27, 69) after transfer as a basis for reduced replication, we transferred splenic B cells from xid mice expressing ectopically a human bcl-2 transgene (xid/bcl-2) into xid recipients. B cells from xid/bcl-2 mice are enriched for mature IgMlow IgDhigh B cells, have enhanced survival in vitro equivalent to that of normal/bcl-2 transgenic B cells, but remain refractory to stimulation with Btk-dependent activators, including anti-Ig (27). As was found with nontransgenic cells, homeostatic proliferation of xid/bcl-2 B cells was significantly reduced compared with that of normal/bcl-2 B cells (Fig. 5⇓B; 10.9 ± 0.3% vs 23.7 ± 0.7%, p < 0.001), demonstrating that the lack of proliferation was not due to reduced donor B cell survival. Reduced homeostatic proliferation of xid B cells. A, CFSE-labeled small splenic B cells (20 × 106) from normal (C57BL/6) or xid (C57BL/6.xid congenics) were transferred into C57BL/6.scid recipients and analyzed on day 12 after transfer; C57BL/6, n = 9 (three experiments); C57BL/6.xid, n = 4 (one experiment); ∗, p < 0.001 compared with normal cells. B, CFSE-labeled small splenic B cells (20 × 106) from normal (CBA/Ca), normal/bcl-2 transgenic (NTG), xid (CBA/N), or xid/bcl-2 transgenic (XTG) donors were transferred into xid recipients (CBA/N) and analyzed on day 12 after transfer as described in Materials and Methods. In other experiments, 40 × 106 CFSE-labeled small total lymph node cells from normal or xid (CBA/N × A.By female or male) donors were transferred into xid (CBA/N × A.By male) recipients and analyzed on day 14. Shown is the mean percent divided ± SE in each donor cell population, gated on CFSE+B220+ cells. Results are from one to two experiments for each donor cell group; n = 4–11; ∗, p < 0.001 compared with normal B cells. The spleens of xid mice contain a higher proportion of immature B cells than the spleens of normal mice; it is possible that the most developmentally mature xid B cell is capable of homeostatic proliferation. To look directly at the behavior of the most mature, recirculating xid B cells, we used lymph node B cells as the donor population in transfer experiments. As was found with spleen cells, lymph node xid B cells have a significant defect in homeostatic proliferation compared with normal lymph node B cells (Fig. 5⇑B; 11.9 ± 0.9% vs 19.3 ± 0.5%, p < 0.001). These results are consistent with the data generated using xid/bcl-2 splenic B cells, which have an increased numbers of mature splenic B cells relative to nontransgenic xid mice (27). Taken together, these data demonstrate that Btk-mediated signaling is important for B cell homeostatic proliferation. Ligand-receptor interactions leading to cell proliferation require the up-regulation or relocalization of transcription factors. For B cells, optimal mitogen- and Ag-induced replication requires members of the NF-κB/Rel family of transcription factors, some of which act downstream of Btk (23, 24). Targeted mutation of the c-rel gene has demonstrated that c-Rel is important for B cell proliferation induced by stimulation through the BCR, CD40, and Toll receptors; but its absence does not affect peripheral B cell numbers or survival in vivo (25, 26). In contrast, loss of NF-κB1 (p50, p105) has little effect on proliferation induced by BCR cross-linking; however, survival of peripheral mature B cells is severely compromised, i.e., their turnover in vivo is markedly increased (26, 70). These observations led us to hypothesize that c-Rel or NF-κB1 knockouts might allow us to distinguish the signals required for homeostatic proliferation from those necessary for mitogen- and/or Ag-induced proliferation or for peripheral B cell survival. 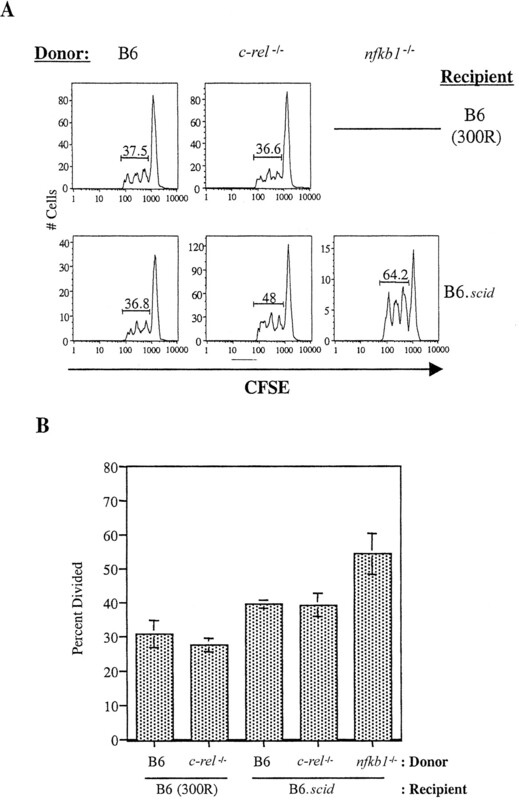 Small resting CFSE-labeled spleen cells from B6, c-rel−/−, or nfkb1 (p50)−/− mice were adoptively transferred into irradiated (300 rad) B6 or nonirradiated B6.scid recipients, and the extent of homeostatic proliferation assessed on day 12 after transfer (Fig. 6⇓). Lack of c-Rel or NF-κB1 had no effect on homeostatic proliferation in B6.scid recipients (Fig. 6⇓B; B6, 39.6 ± 1.3%; c-rel−/−, 39.2 ± 3.4%; nfkb1−/−, 54.3 ± 6.1%). Similar results were obtained for c-rel−/− B cells in irradiated B6 recipients (B6, 30.8 ± 4.1%; c-rel−/− 27.5 ± 2.0%; Fig. 6⇓B). The survival defect of nfkb1−/− donor B cells was exacerbated in irradiated B6 recipients; so few of these B cells remained 12 days after transfer that reliable data could not be obtained for this group. The fact that nfkb1−/− B cells undergo homeostatic proliferation (Fig. 6⇓A) but exhibited impaired survival in vivo (Fig. 6⇓A) suggested that the signals involved in B cell survival and those for homeostatic proliferation were not identical. Although c-rel−/− B cells were unresponsive to anti-Ig+ IL-4 or LPS stimulation in vitro (data not shown), these cells had the same capacity for homeostatic proliferation as did wild-type cells (Fig. 6⇓). This would suggest that individual signal pathways using c-Rel (e.g., BCR, CD40, Toll receptors) are not exclusively involved in homeostatic proliferation. However, it remains possible that productive signals could be delivered by combined signaling through more than one of these pathways. B cells from c-rel−/− or p50−/− mice undergo homeostatic proliferation. A, CFSE-labeled, small resting total spleen cells (35 × 106) from B6, c-rel−/−, or p50−/− mice were adoptively transferred into the indicated recipients. The percentage of B220+ B cells in each donor population was similar. A, Representative histograms showing the extent of proliferation of CFSE+B220+ cells on days 12–13 after transfer. Survival of p50−/− B cells in irradiated recipients was so poor that obtaining reliable data was not possible. B, Shown is the mean percent divided ± SE for each donor cell population, B6 (300 rad) or B6.scid recipients gated on CFSE+B220+ cells. Results were averaged from two independent experiments; n = 6–8 mice/group. Adoptively transferred B cells undergo homeostatic proliferation in adult hosts rendered B cell deficient by mutation (xid, IL-7−/−, or scid) or by sublethal irradiation. Homeostatic proliferation of B cells differs from proliferation induced with Ag or mitogen in that dividing cells essentially maintain a resting phenotype, and fail to develop effector function. In B cell-sufficient hosts, homeostatic B cell proliferation is severely reduced, but not absent, suggesting that a low level of replication may be a normal mechanism for peripheral lymphocyte maintenance. The finding that proliferation is exaggerated by B cell deficiency is consistent with the existence of a regulatory mechanism that allows B cells to sense their own numbers and expand if necessary in response to variations in population density. Homeostatic expansion is held in check by the density of mature B cells in the local environment, a situation found when B cells are adoptively transferred to B cell-sufficient hosts, or when competing B cells are cotransferred to B cell-deficient recipients. The balance between proliferation and density-dependent inhibition maintains a B cell pool of relatively constant size. Previous studies have shown that adult B cells replicate when transferred to syngeneic immunologically immature recipients (31). It was hypothesized that this replication was a response to unique and temporally restricted host factors produced in a developmentally immature environment of rapidly expanding lymphocyte populations. However, we find that nonirradiated adult recipients support homeostatic proliferation, provided that peripheral follicular B cells are absent or reduced. Moreover, B cells actively replicate in scid mice, demonstrating that T cells are not required for B cell proliferation, a finding supported by the extensive replication of adoptively transferred B cells in irradiated CD4−/− recipients (71). Homeostatic proliferation differs from Ag or mitogen stimulation, because B cells that have replicated persist and maintain an antigenic phenotype similar to that of naive B cells. Up-regulation of CD69 is seen on virtually every donor cell transferred into xid recipients indicating that a substantial fraction of these cells receive an inductive signal, but a significantly smaller fraction goes on to divide. This is similar to the response of B cells to stimulation with polyclonal activators such as anti-Ig and LPS where a majority of cells increase in size, but only a fraction of the cells enter cell cycle (72). In our experiments, the cells that divide do show transient increases in size and CD71 expression, but by 28 days posttransfer, the size, IgD, CD62L, and HSA levels are comparable to those seen on resting B cells. A similar observation was made by Sprent and colleagues (49, 73) who showed transferred B cells recovered from nonirradiated scid recipients had replicated and maintained a resting phenotype. Most noteworthy is the fact that a variety of markers induced early on Ag- or mitogen-stimulated cells (CD25, B7-1, and B7-2) are not up-regulated on B cells undergoing homeostatic proliferation. The dividing cells do not differentiate to Ab secretion, as shown by the lack of CD43 and syndecan expression and the maintenance of CD38, IgM, and IgD expression. In contrast to these results, another study has shown that B cells transferred into sublethally irradiated recombination-activating gene (RAG)2−/− recipients replicate and maintain an activated phenotype for up to 2 mo after transfer (74). Irradiation of the recipients may favor the increased activation and differentiation of donor lymphocytes; irradiation induces cytokines and has pro-proliferative effects (38, 39). Irradiation could also enhance the release of stimulatory factors from infectious or commensal agents in the immunodeficient hosts. Alternatively, it is possible that the regulatory checks controlling B cell replication and differentiation are partially active in xid recipients. This would be expected if follicular B cells, which are diminished but not absent in xid mice, mediate feedback. Other studies have shown that T cells induced to divide in irradiated and immunodeficient lymphopenic hosts show increased expression of memory markers (CD44, Ly6C, CD122, CD132, and LFA-1) and can differentiate to express effector functions such as IFN-γ secretion and CTL activity (42, 44, 46). The memory phenotype is stable in RAG−/− recipients, but transient in sublethally irradiated normal recipients (46) in which normal regulatory controls are being re-established by newly emerging reconstituting endogenous T cells. Thus, the number of mature lymphocytes appears not only to control homeostatic proliferation but also their propensity to differentiate to effector function. To initially assess the signaling pathways required for B cell homeostatic proliferation, we examined mutants deficient in a tyrosine kinase (Btk) or transcription factors (c-Rel and NF-κB1) important for Ag- and mitogen-induced replication, survival, and peripheral B cell development. Spontaneous (xid) or induced deficiencies in Btk activity abrogate replication upon BCR cross-linking (63), diminish selection of immature B cells into the mature B cell pool (75, 76), and increase the rate of spontaneous apoptosis in cultured B cells (27, 69). We find that neither xid nor xid/bcl-2 transgenic B cells replicate efficiently when transferred to B cell-deficient hosts, demonstrating the importance of Btk as a component of the signaling pathway inducing homeostatic proliferation. Because homeostatic proliferation of T cells requires self-peptide-MHC complexes (41, 42, 60, 61, 62, 77), it is tempting to speculate that the BCR is similarly involved in B cell homeostatic proliferation. However, xid B cells are also deficient in signal pathways involving other surface receptors mediating B cell growth and proliferation including IL-5R, IL-10R, the Toll-like receptor RP-105, and CD38 (64, 65, 66, 67). Additionally, one or some of these or other signaling pathways could be involved in B cell homeostatic proliferation. For example, receptors for TNF-related B cell growth regulators a proliferation inducing ligand and B lymphocyte stimulator (BLyS): (transmembrane activator and CAML interactor, B cell maturation Ag, and BAFF-R) are found on both mature and transitional B cells. Stimulation through BAFF-R or TACI has been shown to alternatively enhance or suppress B cell activation (78, 79, 80, 81, 82, 83) whereas BLyS/BAFF and BAFF-R have been shown to be critical for B cell maturation survival (10, 11, 84, 85). Interestingly, none of these receptors are known to deliver signals through a Btk-dependent pathway. Because neither BLyS nor a proliferation inducing ligand are mitogenic but serve as costimulators, it is tempting to speculate that optimal homeostatic B cell proliferation is the result of a two signal process, consisting of a primary Btk-dependent signal amplified by a BLyS-initiated second signal. In preliminary experiments, we find that homeostatic proliferation is enhanced when recipients are infused with rBLyS (M. Cabatingan and R. Woodland, unpublished observations). Btk is required for BCR-induced mobilization of c-Rel and Rel A (23, 24). In normal B cells, c-Rel is necessary for B cell proliferation in response to a variety of mitogens, most notably anti-Ig; c-Rel-deficient B cells arrest in G1 and undergo apoptosis following BCR cross-linking (25, 26). However, loss of c-Rel does not affect the maturation or survival of peripheral B cells (25, 26). Given the abrogation of replication in response to signaling through the BCR and other mitogen receptors, we expected a significant impairment of homeostatic proliferation in c-Rel-deficient B cells. Surprisingly, we found that homeostatic proliferation of c-Rel-deficient B cells was robust. This result supports the notion that “strong” BCR signaling is not solely responsible for the induction of homeostatic proliferation. It is important to note that, although proliferative responses to individual mitogens are impaired in c-Rel-deficient B cells, combinations of these same mitogens can act synergistically to promote replication (26, 29). Thus, it is possible that homeostatic proliferation in B cells is induced by the synergistic action of multiple signaling pathways. This would be similar to T cell homeostatic proliferation, which requires signals through the TCR and the IL-7R (12, 13, 17). Targeted mutation of NF-κB1 (p50) transcription factor has multiple effects on B cell development, peripheral survival, and proliferative responses. Although mice deficient in NF-κB1 lack marginal zone B cells, the development of mature follicular B cells is unimpaired (86). It has been proposed that the survival of mature nfkb1−/− B cells is compromised; spontaneous apoptosis in vitro is high and BrdU labeling of peripheral B cells is enhanced (26). Our finding that NF-κB1-deficient B cells replicate actively suggests that distinct signaling pathways are responsible for B cell homeostatic proliferation and B cell survival. Both immature peripheral (transitional) and mature B cells are subject to a feedback mechanism limiting homeostatic proliferation. This is demonstrated by the finding that mature B cells transferred to normal recipients or at high cell doses to immunodeficient recipients replicate poorly. In striking contrast, while homeostatic replication of transferred immature B cells is inhibited in normal recipients, cell dose-dependent inhibition of replication is not seen when high doses of immature B cells are transferred to immunodeficient recipients. This indicates that mature B cells can effect feedback inhibition, but immature “transitional” B cells cannot. The subpopulation of inhibitory “mature B cells” can be further defined. Homeostatic B cell proliferation is robust in xid recipients, which are deficient in B1 and follicular B cells, and in IL-7-deficient recipients, which have a normal complement of marginal zone and B1 cells but are severely deficit in follicular B cells. Taken together, these data indicate that the follicular B cell is the dominant regulator of both immature and mature B cell homeostatic proliferation. A number of mechanisms could account for the regulation of homeostatic proliferation by the size of the B cell pool: competition for, or consumption of, cell-bound or soluble factors that drive homeostatic replication, or the action of a B cell-specific inhibitor found on or produced by follicular B cells. Competition or consumption models seem less likely given our finding that homeostatic replication of mature B cells can be inhibited by high densities of other mature B cells but not by immature transitional B cells. If transitional and mature B cells recognize or require the same stimulatory molecules, then transitional B cells should also compete for the ligands that induce and/or sustain homeostatic proliferation. Our attempts to identify relevant ligands showed that the loss of ligands known to be involved in B cell growth and differentiation (IL-4, IL-6, IL-7, and CD40 ligand) had little effect on homeostatic proliferation (M. Cabatingan, unpublished observations). Another option for explaining the regulation of homeostatic proliferation at high densities of follicular B cells is that replication is inhibited by cell:cell contact or soluble inhibitors active at high local concentrations. This would have the effect of regulating B cell expansion in a cell dose- and lymphocyte subpopulation-specific manner. Inhibitory activity could be developmentally regulated or dependent on a specific signal transduction pathway for induction. The former possibility is suggested by the poor inhibition induced with xid B cells, and the latter possibility is suggested by our findings that adoptively transferred normal B cells actively replicate in xid/bcl-2 recipients despite the fact that these transgenics have a 2-fold increase in B cells with a mature phenotype compared with those of normal mice. The requirements for the induction of inhibitory signals and the regulation of expression of inhibitory molecule(s) are currently under active investigation. We find a small degree of replication after adoptive transfer of normal B cells into nonirradiated normal recipients; this suggests that homeostatic proliferation occurs normally at a low level and may directly contribute to normal B cell homeostasis. Homeostatic proliferation can provide a mechanism for the Ag-independent maintenance, self-renewal, and expansion of B cells selected into the mature B cell pool, in the absence of B cell input from the bone marrow. Moreover, the B cells generated by this mechanism retain their naive character, avoiding the generation of memory B cells thought to compromise immune responses during aging (87). We thank Drs. Rachel Gerstein and Janet Stavnezer (University of Massachusetts Medical School) and Dr. Joan Press (Brandeis University) for their critical review of the manuscript and thoughtful comments. We also thank Debra Bennett for technical assistance, Marcia Woda, Barbara Fournier, Tammy Krumpoch, and Jihong Li at the University of Massachusetts Medical Center FACS facility for their expertise and skill, and Dr. H. C. Liou (Cornell University Medical School) for c-rel−/− mice. ↵1 This work was supported by Public Health Service Grants AI41054, AG15178 (to R.T.W. ), and AG19440 (to M.R.S.) and American Cancer Society Grant IRG 93-033 (to M.R.S.). ↵4 Abbreviations used in this paper: BCR, B cell Ag receptor; BAFF, B cell-activating factor; Btk, Bruton’s tyrosine kinase; HSA, heat-stable Ag; BLyS, B lymphocyte stimulator. Mishell, B. B., S. M. Shiigi. 1980. Selected Methods in Cellular Immunology Freeman, San Francisco. Cabatingan, M. S. 2001. Mechanisms of establishment and maintenance of RNA virus persistence in primary lymphocytes. Doctoral dissertation, University of Massachusetts Medical School, Worcester, MA.